My friend and fellow author Charlie Plunkett is doing a Kindle promo that ends on 4th March so I’m posting on my blog to help spread the word about it for her. One of her books (and she’s written 4!) is called 100 Little Words on Parenthood. 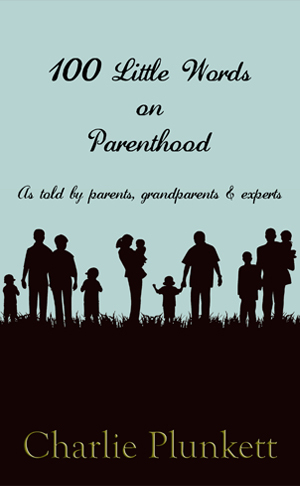 It’s a collection of poems, words and anecdotes of 100 words each about parenthood written by parents, writers, bloggers and grandparents. I am one of those contributors and my words can be read on pages 67 and 103. Don’t miss out! This wonderful book is downloadable for just 99p until the 4th of March! The sun has made a rare appearance and signals a hint that spring is just around the corner, hooray! Spring for me is a time of new beginnings, driving through the countryside watching new born lambs gleefully bouncing around and the blossom on the trees heralding an end to a long and very wet winter. New beginnings don’t come much more special than the arrival of a baby and with Mother’s Day fast approaching I wanted to celebrate all aspects of parenthood by sharing details of a book I have compiled, along with around 100 fabulous mums, dads, grandparents and experts. 100 Little Words on Parenthood is a beautiful collection of anecdotes, poems, words of wisdom and humour on all aspects of parenthood. From the miracle of birth and those early days of sleep deprivation, breastfeeding and teething each childhood milestone is charted. First steps, funny things children say, toddlers, tantrums, teenagers and grandchildren are all celebrated in this book that will appeal to new parents, experienced parents, grandparents and those considering becoming parents. From 26th February until 4th March 100 Little Words on Parenthood will be available on Kindle Countdown to download for just 99p. For an extra special gift order the paperback version as a gift for £9.99. 100 little words is a little treasure, perfectly complemented by the little truisms and quotations interspersed between each contributor’s special memory. A joy to read, a delightful gift. I feel this could be great for new parents for a fun and intriguing read to see the enjoyment others have experienced. Yes; put away those guide books and get this! A beautiful collection of thoughts and anecdotes that makes you smile, laugh and shed a tear. Very well collated and a joy to read…. When I was pregnant I read everything I could about pregnancy and parenting. Most books went into great detail. But 100 Little Words on Parenthood gives you all the best bits cut down into 100 word snippets. It makes you laugh, it makes you cry, but most of all as a parent it makes you realise your not alone! A really nice collection of poems, anecdotes, true stories and helpful tips about babies, kids and parenting. Touching, informative and amusing too. A beautiful, poignant and funny collection. Thank you Charlie for creating such a magical little book. 100 Little Words is an insightful collection of accounts of parenthood from the front line. Covering every aspect from birth to becoming a grandparent Charlie has managed to pull together a rich variety of writers to contribute to this masterful collection of parental reflections. It’s genuinely funny, often heart-breaking and always honest. Any parent would be wise to purchase this to gain insight into the often bewildering world of parenthood. Charlie Plunkett is the author of 3 books called The True Diary Series, 100 Little Words on Parenthood, and is currently working on her 5th book called The Toddler Files.